Copyright ©2018 by George Reisman. All rights reserved, except that this post may be reproduced and distributed electronically, but only in full, including graphic(s), and with notification to the author at greisman1937@gmail.com. On April 30 of this year , The New York Times ran an op-ed piece titled “Happy Birthday, Karl Marx. You Were Right!” In view of the fact that the implementation of Marx’s philosophy in the Soviet Union and in Communist China resulted in general economic chaos, including shortages, rationing, interminable waiting lines (14 hours a week just to buy food), and multiple families having to live in the same apartment, plus forced labor, concentration camps, show trials and periodic purges to shift the blame for it all, a reign of terror, famines, and as many as 62 million murders in the Soviet Union and 76 million in Communist China (including those killed by the government-caused famines)—in view of all this, congratulating Marx on being right boggles the mind. Marx could be right only if one’s standard of right was human misery and death. Only someone utterly depraved could make such a statement. Only an utterly depraved, despicable newspaper could endorse such a statement, and the feather-weight rationalizations offered in support of it, by printing the piece. In every essential respect, the philosophy of Marxism/Socialism is a philosophy designed for sociopaths—for people who attempt to appear merely as seeking to do good, by posturing as friends of the poor and of humanity at large, but who have no respect for the individual rights of others, who have no awareness that others have independent minds and think and plan on their own initiative, who denounce such thinking and planning as “anarchy” (an “anarchy of production”) and try to squelch it, who regard others as mere objects to be willingly or unwillingly manipulated in the achievement of the Marxists’/Socialists’ grand plans for the human race, and whose response to the suffering and deaths of millions is along the lines of “to make an omelet, you have to break some eggs.” Marxism/Socialism is a philosophy for the depraved, for those of a warped intellectual and moral capacity and thus capable of appearing now as morons and now as murderers. It is a philosophy designed for a special breed of such vermin: for those who, despite often thinking at the level of morons, nevertheless believe that they are more intelligent than other people, so much more intelligent in fact, that they know better how to run other people’s lives than those other people themselves do and are entitled to use force to impose their will on them. Marxism/Socialism is the philosophy of a breed of mental cases whose ignorance is exceeded only by its arrogance and viciousness. The resurgence of Marxist/Socialist ideas should not be surprising. Despite the fall of Communist regimes around the world, the essential ideas of Marxism/Socialism remained, and still remain, largely untouched and unchallenged. These ideas pertain to the relationship between capitalists and wage earners, and they are accepted by the great majority of people in the United States and throughout the world. They are accepted not as being descriptive of the way conditions actually are in the United States or in any other advanced country of the present day, but as descriptive of the way conditions would be in the absence of major government intervention. And they are accepted as both descriptive and explanatory of the way conditions were in the nineteenth century. Thus, people believe that in the absence of government intervention in the form of pro-union, minimum-wage, maximum-hours, and child-labor legislation, and laws regulating working conditions, the capitalists, in their greedy pursuit of profits, would drive wages down to, or even below, minimum physical subsistence, lengthen the hours of work to the maximum possible, force small children to work in factories and mines, and make working conditions unbearable for all. All that allegedly stands in the way of this nightmare-world ready to be unleashed by the unrestricted operation of capitalism and the profit motive is legislation inspired by Marxism/Socialism. This view of things appears to be held¸ and to have been held for more than a century, by virtually all Democrats and perhaps half or more of the Republicans. The refutation of these and many other major errors about the nature of capitalism, along with a demonstration of the destructive and totalitarian nature of socialism, is the subject of this essay. To connect these remarks to the title of my essay, let me say that Marxism/Socialism is a philosophy conceived in gross error and ignorance about the nature of capitalism, above all about the nature of the relationship between capitalists, profits, and wages. 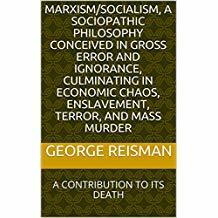 Socialism is little more than a violent rejection of capitalism, based on this combination of errors and ignorance, and which, once having managed to destroy capitalism, results in economic chaos, enslavement, terror, and mass murder. Socialism and its consequences can be likened to the assault of a barbarian tribe become enraged at the relative prosperity of a civilized land. After destroying the fields, the livestock, the roads, and the aqueducts of the civilized land, it finds itself with nothing but a few remaining scraps over which its members kill one another. That is the essential situation of today’s socialist barbarians, inspired by Marx to hate capitalists and the civilization that they have built. What the socialist barbarians destroy is private ownership of the means of production, the profit motive, private saving and capital accumulation, competition, and the price system. In destroying them, these barbarians have no idea that in doing so they are destroying the foundations of material civilization, in which they have shared and could continue to share. It is the purpose of this essay to teach those of them that both know how to read and have not yet reached the point of burning the writings they fear, the actual nature of capitalism and of Marxism/Socialism, in the hope that they will then become defenders, rather than destroyers, of capitalist civilization. R. J. Rummel, Death By Government (New Brunswick, N.J., Transaction Publishers, 1994), n. 1. Copyright ©2018 by George Reisman. All rights reserved, except that this post may be reproduced and distributed electronically, with notification to the author at greisman1937@gmail.com.